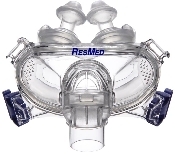 CPAP/BiPAP masks designed specially for the female user. Nasal Masks for CPAP and BiPAP users cover the face from the bridge of the nose to just below your nose. Many sizes available with adjustable headgear to fit most. You may need a chinstrap to help keep your mouth sealed to stop dryness. Hybrid Masks cover only the nares of the nose and seal around your mouth. This can replace a full face mask and still breathe through your mouth and nose. Many sizes available with adjustable headgear to fit most. Full Face Masks cover the face from the bridge of the nose to your chin, giving you the ability to breathe through your mouth and nose. Multiple sizes and adjustable headgear from Care Fusion, Fisher & Paykel, Philips Respironics, Resmed and more. Nasal Pillow Masks for CPAP and BiPAP users seal to only the nares of the nose. Many sizes available with adjustable headgear to fit most. You may need a chinstrap to help keep your lips sealed to prevent dry mouth and tongue. Oral Masks for CPAP and BiPAP users, seals around your mouth at your lips, with a inner and outer flap, and nose plugs to prevent nasal leakage as needed. Fisher & Paykel has the Oracle to meet this need!